Supremacy and Survival: The English Reformation: Like Mother, Like Daughter? Joanne Whalley in "Wolf Hall" and "The Virgin Queen"
Like Mother, Like Daughter? Joanne Whalley in "Wolf Hall" and "The Virgin Queen"
Cromwell then moves from Henry VIII’s future woman [Jane Seymour] to his past woman: Catherine of Aragon. The first wife, after 20 years of marriage, fought hard to preserve her rights, and is still refusing to answer to anyone who will not address her as queen—despite the fact that Henry VIII has married Anne Boleyn and had a child with her. “That’s why he sent you, to see if I am really dying,” she says, weak and fighting spasms of pain. She pleads with Cromwell to allow her to see Mary, the daughter whom Henry keeps isolated and away from Catherine. Finally she says she heard “Boleyn’s daughter” had a miscarriage. “I know how that is,” she says, showing a humanity Anne never for an instance extends her way. Catherine is also shrewd and picks up on the fact that Cromwell doesn't know if Anne is pregnant again. “I thought she always confided in you—I do hope there is no rift,” she says, allowing herself a moment of malice. In the next scene, an important character, Eustace Chapuys, ambassador to the Emperor Charles V, emerges from the dark shadows of Cromwell’s sitting room at home. They drink wine together, in Cromwell’s increasingly luxurious home, hung with a large tapestry the king personally gifted to him. “I hear you’re going to put all the monks and nuns out on the road,” says Chapuys sternly, referring to the Dissolution of the Monasteries, one of Thomas Cromwell’s main achievements. Thousands of monks, friars and nuns were in reality ejected from their abbeys as Cromwell oversaw their destruction, the buildings stripped of value and given to the king’s friends. In this scene, Cromwell assures Chapuys that most of the nuns and monks wanted to leave when his commissioners visited their abbeys, which were places of corruption and vice. This is where Wolf Hall falls back into the distortion and propagandizing which marred the previous episode, “Devil’s Spit.” The massive corruption that Cromwell keeps referring to throughout Wolf Hall is exaggerated. It was a pretext to convince Parliament to make legal the seizure of the buildings and land, which poured thousands of pounds into Henry VIII’s treasury. In a bizarre fiction, Chapuys says, “I see famine before the spring. You’re buying corn from the territories of the Emperor. This trade could be stopped.” When Cromwell asks quietly what Emperor Charles V would gain from starving England, Chapuys says it would prove how badly governed the kingdom of England is. In the 16th century, the country was in no way reliant on importing food from the land controlled by the Holy Roman Emperor, which included Spain, Portugal and Austria, the German lands, the Netherlands, and part of the Americas. There was trade between England and the Netherlands, mostly of wool. The threat of starving a country to make a point of politics belongs to some more modern age. Also, the show must mean “wheat” when Chapuys says “corn,” a common description of the time, because in the reign of Henry VIII the English did not eat maize, which was discovered by Spanish explorers in Mexico. Wolf Hall is back on solid ground when Chapuys tearfully begs to be able to see Catherine of Aragon so that she will not die “all alone.” When Cromwell asks the king and queen on Chapuys’ behalf, Anne mocks Catherine. It seems that permission is refused, but in reality Henry VIII relented and Chapuys did visit her in exile the week before she died. Actress Joanne Whalley is keen to clear up exactly who Queen Mary was, "No one really knows about her. You say I'm playing Queen Mary and they go, 'Oh, Mary Queen of Scots?' and you go 'No! Mary Tudor!' - and they don't know who she is. She is completely overshadowed by Elizabeth - as she was in their time." "She has a terrible reputation as Bloody Mary but she didn't have an easy time of it. She had a terribly unhappy childhood; she has an unhappy marriage, a nightmare half-sister and religious trouble, so she has a full plate!" "Elizabeth's mother (Anne Boleyn) replaced Mary's mother in the favour of the King; Mary's mother was sent away to live in exile and Mary wasn't allowed to see her, and she was forced to wait upon Elizabeth's mother," explains Joanne. "So there's a lot of history in their relationship and her paranoia, her fears, are all based in reality. She could have had Elizabeth killed really, but didn't - she was not an unkind person. There are various reports of her showing this much more kind, benign side of her personality, but given the times that she was in that bit wasn't allowed to shine through very often." "She had a miserable and difficult journey to becoming Queen and it turns out very differently than she had imagined," says Joanne. "One of the keys to that is her relationship with her husband, Philip of Spain. She was hoping for a real marriage, she thinks how wonderful to have a companion - and there was nothing. They had no relationship at all really which is a huge disappointment to her." All they really seemed to share was their Catholic religion and the desire to overturn the years of Protestant rule instigated by Mary's father, Henry VIII, which led to the religious persecution that earned Mary her gruesome nickname. "She was very devout and she believed absolutely that she was putting things to rights with the country and in the eyes of God," says Joanne. "Crazy as it is, there is some sympathy to be drawn - she was completely devoted; in her life and her work, everything, she believed she was doing the right thing. Her only moments of joy and pleasure were in her more devout, communing-with-God moments because day-to-day life was pretty tough on her. She was very alone and very conflicted about how to deal with things. I feel sorry for her." "We don’t often think of the women around him when we think of Henry VIII. But we should because they were amazing and they operated within such restraints. I didn't expect to like Catherine of Aragon as much as I did. But she was an extraordinary woman. She was well educated and very much into education for women. Women at the time were not generally allowed to run things. But she grew up with her mother as an example - Queen Isabella of Castile - so she wasn't bound, at least in her own mind, by the restrictions of the time. It’s interesting how Elizabethan costume affects everything you do: how you sit, how you stand, how you carry yourself. You don’t have the same physical freedom. And the locations too: I remember shooting at Broughton Hall on the hottest day of the year. The walls were so thick but it was cool inside. You could feel the history in the walls." On the one hand, it's great to have Nancy Bilyeau correct some of the historical inaccuracies in Wolf Hall; on the other, it's great to see an actress have some sympathy with the historical characters she plays. While she's appearing as the sixteenth century Catherine of Aragon on PBS, Whalley's portrayal of Claudia, Pontius Pilate's wife is on NBC, in A.D. The Bible Continues. The purpose of this blog is for me to publish not-quite-daily updates on my continuing research on the English Reformation and its aftermath, especially for Catholics until Emancipation in 1829; I'll particularly highlight the stories of the Catholic Martyrs of England and Wales, especially those beatified and canonized by the Holy See. 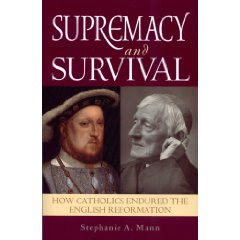 I will also highlight promotional events for Supremacy and Survival: How Catholics Endured the English Reformation. If you like my blog, you might like my book, available from these retailers, on Kindle, and Nook! [If you want a signed copy, please contact me via email: englishreform(at)cox(dot)net]. Comment moderation is turned on; since I am not a full-time writer/blogger but have a full-time job outside the home please be patient with me logging in to approve comments. Unsigned Anonymous comments will not be published. I am a member of the Speakers Bureau for the Diocese of Wichita. 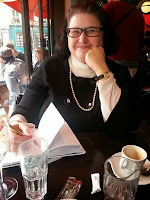 Please see my profile here, including a list of topics and sample presentations. Four Spaniards and One Saint! "Planets, Priests, and a Persistent Myth"
St. Edmund Campion and the "Magna Carta"
Eighth Day Books in The New York Times!! The pictures and illustrations from other sources on my blog are in the public domain as far as I am able to ascertain. When I post photographs that I have taken, my common copyright to them is asserted. Please do not post on other sites without my express permission. When I link to another blog or website, please understand that it does not necessarily mean that I recommend or agree with everything on that blog or website. Finally, please remember that links may not always work because pages move or expire on other websites. Thank you. Contents Copyright Stephanie A. Mann 2010-2018. Simple theme. Powered by Blogger.